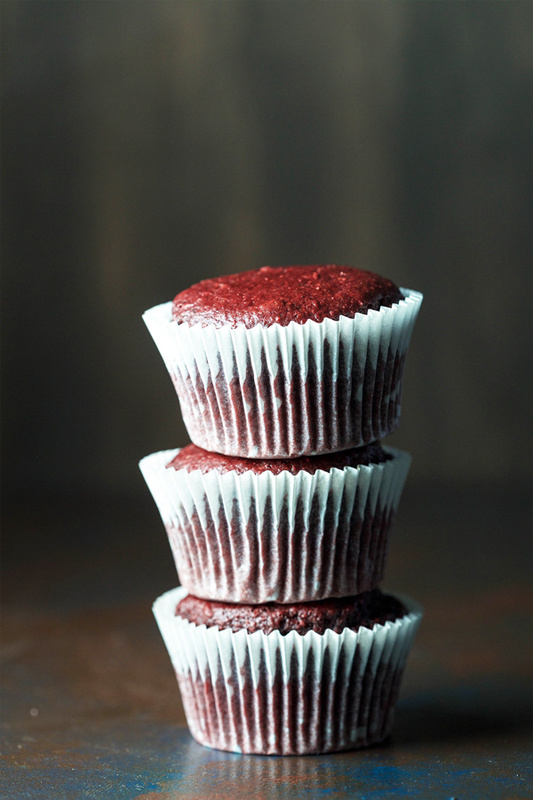 It starts with a fudgy red velvet chocolate chip cupcake made with roasted beetroots. The finish? Raspberry and rosewater vegan frosting. 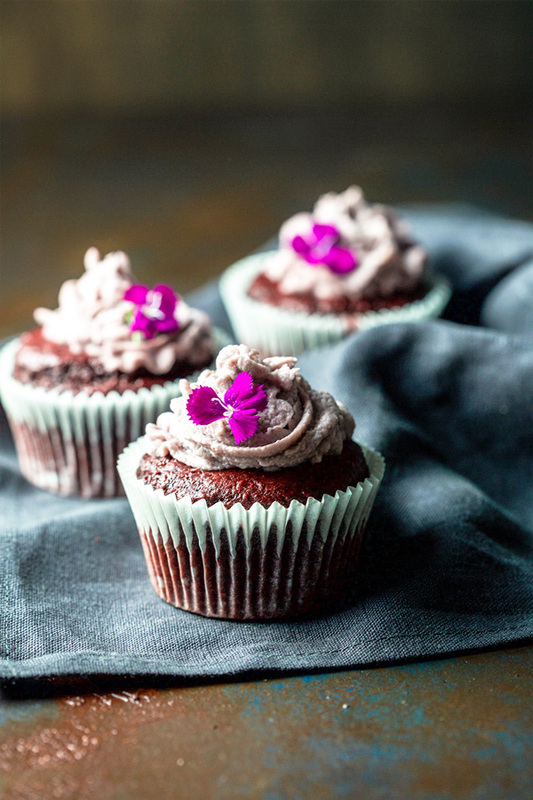 These Vegan Turkish Delight Cupcakes are sweet, but not too sweet, easy enough for the novice baker and a far healthier luxury treat than most cupcakes. They are so so pretty and the perfect Mother’s Day spoil. AND, if you aren’t a fan of the Turkish Delight, skip the rosewater and you have an equally delicious Red Velvet and Raspberry cake. Simples. I am so happy with these little cakes. Besides looking as pretty as a picture, they are, as far as sweets go, pretty healthy. 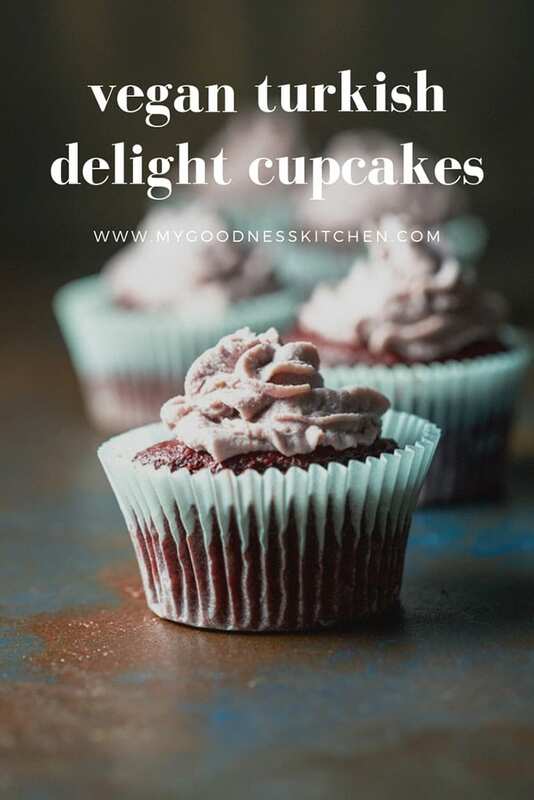 My Vegan Turkish Delight Cupcakes have no processed sugars just coconut sugar, no butter, and added beetroot to give a lovely colour and a boost of antioxidants. The icing is made from cashews, maple syrup, vanilla, raspberries and a good dash of rosewater. Non-vegany types can skip the arm workout by simply making a butter cream and adding raspberries and rosewater syrup. Us non-dairy types are in for a wee upper body workout but it is worth it. Bright side? You burn off some of the calories before the cakes are even out of the oven. Bonus! The whipping of the cashew cream icing is the hardest part of this recipe. The rest is easy peasy. Trust me. We have a rule here at Goodness Headquarters when it comes to baking. Say it with me, folks. I am not a good baker and I have a love/hate relationship with flour. I love it but it is a tragic, unrequited love. Flour is, in general, not my friend. I either overwork it or look at it funny and I end up with hard little cakes that would better serve the military as missiles. 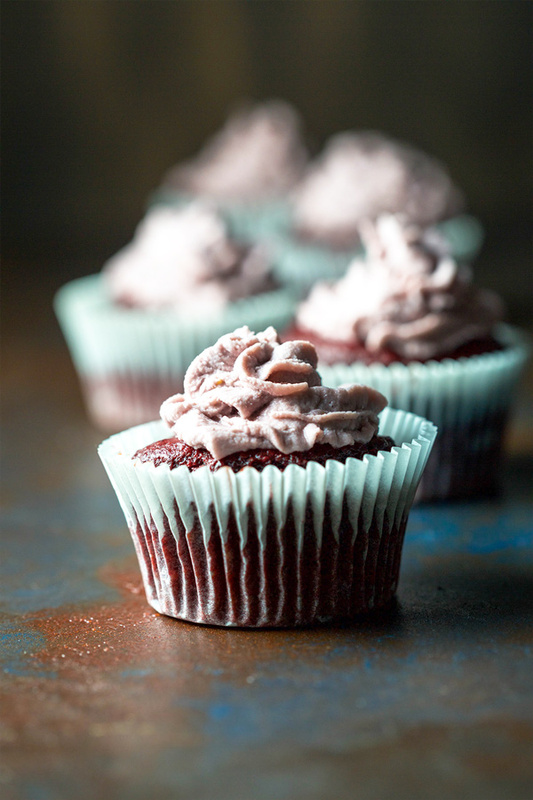 These Turkish Delight Cupcakes like me, as Sally Field would say, they really like me. They are fudgy, just sweet and the flavours balance each other perfectly. PS. I found a GREAT technique for creating a thick, creamy frosting for piping. The Humming Bird Cupcakes from Allison at Yummy Beet look pretty wonderful too. Enjoy. 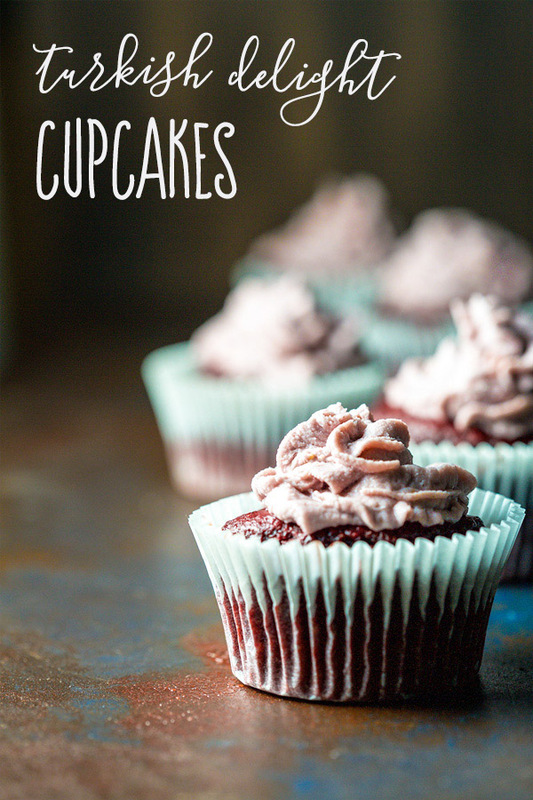 Vegan red velvet chocolate chip cupcakes with raspberry and rosewater frosting. 1/4 cup dairy free chocolate chips. Preheat the oven to 170 degree C and line a muffin tray with cupcake papers. Sift both flours, baking powder and cacao in to a large bowl. Add the sugar and salt and gently stir to combine. In a food processor blend together the roasted beetroots and 1/2 cup almond or soy milk until smooth. Add the vanilla, maple syrup and olive oil and pulse briefly. 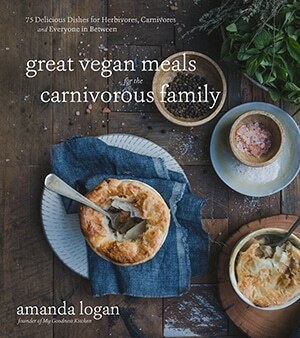 Fold the wet ingredients and the second half of almond/soy milk in to the dry ingredients until just combined. Fold in the chocolate chips. Spoon the mixture in to the cake moulds to 3/4 full. Bake for 20 minutes or until the cake springs back to the touch. To make the frosting, blend ingredients until smooth. This may take a while. Pour the mixture in to a bowl and place in the freezer for 10 minutes. Remove from freezer and whip for 2 minutes or so. Return to freezer for another 5 - 10 minutes. Whip again. Repeat until soft folds appear and the mixture can be spooned in to a piping back. Pipe frosting on to completely cooled cakes and serve. Thank you Rebecca! That’s so lovely of you. Thank you so much Aimee. That is lovely of you to say.